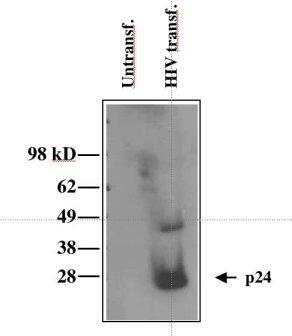 Reacts with Human Immunodeficiency Virus Type 1(HIV 1) p24 protein. Cross reacts with Human Immunodeficiency Virus Type 2 and Simian Immunodeficiency Virus (SIV). Our Abpromise guarantee covers the use of ab9072 in the following tested applications. Radioimmunoprecipitation Use at an assay dependent dilution. Sandwich ELISA Use at an assay dependent concentration. Can be paired for Sandwich ELISA with Mouse monoclonal [39/5.4A] to HIV1 p24 (ab9071). This image is courtesy of an anonymous Abreview submitted on 13 February 2006. Publishing research using ab9072? Please let us know so that we can cite the reference in this datasheet. I can confirm that the Anti-HIV1 p24 antibody [39/5.4A] (ab9071) and the Anti-HIV1 p24 antibody [39/6.14] (ab9072) were made by injection of purified HIV-1 (Strain IIIB) lysate into mice. Sorry, I meant HIV p24. We unfortunately cannot offer your a sELISA system in which the detection is conjugated either with HRP or Biotin. The good news is that we indeed have matched pairs of p24 antibodies, and we have conjugation sets for both HRP and Biotin. https://www.abcam.com/index.html?datasheet=9071 (or use the following: https://www.abcam.com/index.html?datasheet=9071). https://www.abcam.com/index.html?datasheet=9072 (or use the following: https://www.abcam.com/index.html?datasheet=9072). https://www.abcam.com/index.html?datasheet=102867 (or use the following: https://www.abcam.com/index.html?datasheet=102867). https://www.abcam.com/index.html?datasheet=102891 (or use the following: https://www.abcam.com/index.html?datasheet=102891). Please check this product out, and if you find them suitable, send my colleges from orders@abcam.com a request for the amount you need. I purchased ab9071 and ab9072 as they are noted on the Abcam website to be useful as a matched pair for sELISA. However the anti-mouse HRP secondary is binding to the capture antibody as well as the mouse detection antibody, producing a very high signal even when no p24 is present. I am sorry this product did not perform as stated on the datasheet and for the inconvenience this has caused. As requested, I have issued a free of charge replacements for one vial of ab63913 and one vial of ab16284 with the order number 1147505. Hi, I have ploughed through the review and Q&A regarding to the paring mAB for sandwich ELISA using HIV-1 p24 as the antigen. I have had AB9071 in house. I wonder whether you have information or may hear any issue if I immobilise ab9072 to pair with AB9071 in the sandwich assay? Thank you. I can confirm that anti-HIV1 p24 antibodies ab9071 and ab9072 are suitable for use in performing sandwich ELISAs to detect HIV1 p24. They recognise different epitopes of the protein and have been used previously as a pair for this application. Thank you for the interest in these products. The antibodies mentioned Anti-HIV1 p24 antibody [39/6.14] (ab9072) and Goat polyclonal Secondary Antibody to Mouse IgG - H&L (HRP) (ab6789) have both been tested separately using ELISA and should be compatible in detecting HIV-1 p24 with an ELISA. Alternative secondary antibodies that could be used are: Goat polyclonal Secondary Antibody to Mouse IgG1 - heavy chain ab97237 which is Alkaline Phosphatase conjugated or Goat polyclonal Secondary Antibody to Mouse IgG1 - heavy chain (ab97238) which is Biotin conjugated Detection with the HRP secondary antibody can be performed using an HRP substrate such as TMB, DAB or the chemiluminescent HRP substrate offered by Abcam: ab5801. An additional product that may be of help to you is the purified p24 protein such as ab43037 which can be used in the ELISA as a control. A good guide to setting up an indirect ELISA can be found here: https://www.abcam.com/index.html?pageconfig=resource&rid=11389 One thing to bear in bear in mind when implementing the ELISA is to consider the background peroxidase activity that may be present from the sample (such as in red blood cells). This can be dealt with by blocking treatment using 0.3% H2O2. It is important to note that all Abcam products are to be used for research purposes only and are not intended for diagnostic or therapeutic use. For more information on this please refer to our terms: https://www.abcam.com/index.html?pageconfig=terms If you want any further advice in setting up the ELISA or any other information please do not hesitate to contact us again. I'm interested in your antibody products specific to p24 protein of HIV, such as ab19054, ab9072. But I couldn't find the epitope information in the datasheet of these products? Thank you for your enquiry. We do not know the epitope recognized by these two antibodies. I hope this information helps, please do not hesitate to contact us if you need any more advice or information. Could you please let me know whether your company had evaluated ab9072 p24 by WB? If yes, could you send me a scanned image of your data? The band that I am getting is appearing at the 25kDa, slightly higher than p24. As I have told you before that I was quite pleased with the p24 MAB that I had used for WB studies. The earlier one was given to me by a colleague. It had lot number 65512. On 8/17/04 I had purchased one myself, it had lot number 24851. I was happy with the WB results. Then 0n 9/14/04 I received another p24 MAB (ab9072), lot number 17586 and this one didn't work. The experiment carried out on 9/09/04 was repeated using the same samples. Even the p24 antigen that I had used, did not show a positive band; and my two samples, which gave me positive p24 bands earlier, showed completely different bands. The same sample tubes used earlier, was used again. I have attached both copies of the blot. I am quite surprised and am not sure what to say. Thank you for your email and I'm sorry to hear that you are experiencing difficulty with the latest vial that you received. As this is the third vial of ab9072 that you tried and the previous two vials worked well for you, my hunch is that there was a problem with the vial/batch that you received. I can send you a different batch free of charge if you would like. Just me know, and also, I was unable to open the files that you sent - can you re-send the images as jpg files? Thank you, and I look forward to hearing from you. Customer would like to know the epitope sequence. Also, does this antibody cross-react with other viral antigens? We have not had this antibody sequenced. It may react with HIV-2 p27, but this is all the information that we have at this time.